Dayan passes down the life lessons that all generations should hold close in new book. Passing on the knowledge I learned throughout my life and inspiring future generations is really the whole reason behind this book. Living a fulfilling life can be hard, especially when faced with difficult decisions or unfortunate circumstances. 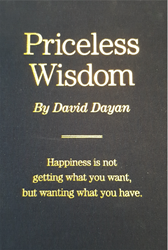 In “Priceless Wisdom,” author David Dayan provides readers with pages of snippets and short stories that are his way of ensuring essential lessons survive for future generations to share. Dayan believes himself to be the wealthiest person he knows because of the people in his life and has found that happiness is not getting what you want, but wanting what you already have. Dayan is inspired every day by his family, friends and his faith and wants to continue enriching people’s lives and making them better by passing on the knowledge he learned throughout his life. For more information visit http://www.pricelesswisdom.org. David Dayan lives in Brooklyn, New York, with the people who inspire and challenge him to live his best life. Dayan is retired and spends his time with family, friends and God while also encouraging future generations to live fulfilling lives.